The Diamond Jubilee of Elizabeth II was a multinational celebration throughout 2012, that marked the 60th anniversary of the accession of Queen Elizabeth II on 6 February 1952. The only other time in British history that a monarch celebrated a Diamond Jubilee was in 1897, when Queen Victoria celebrated hers. Commemorative events were held throughout the Commonwealth of Nations. Unlike the Queen's Silver and Golden Jubilees, when the Queen toured most of her realms around the world, Elizabeth II and her husband the Duke of Edinburgh, toured only the United Kingdom. Other parts of the Commonwealth were toured by her children and grandchildren as her representatives. In this special year, as I dedicate myself anew to your service, I hope we will all be reminded of the power of togetherness and the convening strength of family, friendship, and good neighbourliness, examples of which I have been fortunate to see throughout my reign and which my family and I look forward to seeing in many forms as we travel throughout the United Kingdom and the wider Commonwealth. At the 2011 Commonwealth Heads of Government Meeting in Perth, Australia, British Prime Minister David Cameron announced the creation of the Queen Elizabeth Diamond Jubilee Trust, which was officially launched in the UK on 6 February 2012. Chaired by former British prime minister Sir John Major, the trust was intended to support charitable organisations and projects across the Commonwealth of Nations, focusing on areas such as cures for diseases and the promotion of all types of culture and education. In early 2012, Prime Minister of Australia Julia Gillard announced the Australian Crown-in-Council would make an A$5.4 million contribution to the trust and the New Zealand Crown-in-Council later made a similar $1 million donation. The Canadian government announced in April that former prime minister Jean Chrétien would be Canada's representative to the organisation. In February 2012, a senior advisor was quoted as saying the Queen set two guidelines for the planning of her jubilee: the use of public funds should be minimised and people should not "be forced to celebrate". The first major international event of the jubilee celebrations was the Diamond Jubilee Pageant, also branded The World Comes to Windsor, a cavalcade held at Windsor Castle to celebrate the Queen's visits to and tours of over 250 countries, as well as her passion for horses. The show, which featured 550 horses and 1,100 performers from around the world, was performed in the evenings between 10 and 13 May, after the daytime events of the annual Royal Windsor Horse Show had taken place. The Queen attended the final night. On 18 May, the Queen hosted an informal lunch at Windsor Castle for more than twenty current or former monarchs from other countries. In the evening of the same day, the Prince of Wales and the Duchess of Cornwall hosted a dinner that most of the monarchs also attended, although the Queen herself was not present. Criticism was directed at the presence of the King of Bahrain at the lunch, because of alleged repression of protests against the government of Bahrain in that country in 2011. In London, protesters against the King assembled outside Buckingham Palace during the dinner, although he did not attend that event. The lighting of thousands of beacons across the Commonwealth took place on 4 June. The number of beacons was originally set at 2,012; by the closing date for registrations, approximately 4,000 had been submitted in the United Kingdom alone. The first beacon of the Jubilee was lit on the grounds of Apifo'ou College in Nukuʻalofa, Tonga, by Tongan girl and Boy Scouts using coconut sheath torches. Other nations, including Kenya, Australia, New Zealand, India, Seychelles, Sri Lanka, and several Caribbean states, took part in the beacon lighting. The world's most remote beacon was lit in Tristan da Cunha in the south Atlantic, using invasive, non-native plants to fuel the fire. In the United Kingdom, British servicemen and women wounded in battle and individuals representing charities carried beacons to the summits of the UK's four highest peaks. One beacon was lit at Treetops Hotel in Aberdare National Park in Kenya, where the Queen was at the moment of her accession to the throne. The Queen lit the beacon outside Buckingham Palace at 10:30 pm, by inserting a large, specially made, diamond-cut crystal into a receptacle. The lighting proceeded until the final beacon was lit in Canada eight hours later. The Queen's husband, Prince Philip, Duke of Edinburgh, was hospitalised with a bladder infection on 4 June and thus was not able to attend any of the official events. In his speech given at the conclusion of the Diamond Jubilee Concert, the Prince of Wales commented on the sadness of his father's absence and urged the crowd to cheer loud enough for the Duke to hear in hospital. Prince Edward, Earl of Wessex, stated after visiting his father that the latter was watching the celebrations on television. The Queen visited the Duke the following day. That same evening, a pre-recorded message by the Queen was released and aired on television around the world. Elizabeth stated: "the events that I have attended to mark my Diamond Jubilee have been a humbling experience" and also expressed her thanks to those who had organised the celebrations over the extended weekend, ending by saying: "I will continue to treasure and draw inspiration from the countless kindnesses shown to me in this country and throughout the Commonwealth. Thank you all.". Quentin Bryce, the Governor-General of Australia, announced that the Diamond Jubilee would be celebrated "with a host of national and community events throughout the Commonwealth." In a similar vein, it was said in late 2011 that the government of Queensland was planning to declare a holiday in June 2012 to mark the jubilee. The Royal Australian Mint announced in August 2011 that it would be releasing a silver proof 50-cent coin to celebrate the Queen's Diamond Jubilee. Australia Post issued a series of special stamps to mark the occasion. Paying tribute to Elizabeth II as Queen of Australia in the House of Representatives on 6 February 2012, Prime Minister of Australia Julia Gillard stated the Queen was a revered figure in Australia. Gillard also announced that she would on 4 June light a beacon atop Parliament House and that a street in the parliamentary triangle in Canberra would be renamed Queen Elizabeth Terrace. Meanwhile, Western Australian Premier Colin Barnett announced on 28 May that a new waterfront development in Perth would be named Elizabeth Quay in the Queen's honour. A detachment of the New South Wales Mounted Police performed at the Diamond Jubilee Pageant held at Windsor Castle in May 2012. At the end of the same month, Prince Charles presented Diamond Jubilee medals to those in the Victoria Cross and George Cross Association, including three Australian Victoria Cross recipients. A special ecumenical service was conducted in St James' Church, Sydney, at which the invited preacher was Cardinal George Pell and the Governor of New South Wales, Marie Bashir, was the guest of honour. The Anglican Church of Australia also held a service of prayer and thanksgiving to commemorate the Diamond Jubilee at St John's Cathedral in Brisbane, on 20 May 2012. The service was welcomed by Phillip Aspinall, Anglican Archbishop of Brisbane, and the Homily was given by Mark Coleridge, Catholic Archbishop of Brisbane. The guest of honour was the Governor of Queensland, Penelope Wensley, and Ian Walker represented the Queensland Cabinet. Between 5 and 10 November 2012, Charles, Prince of Wales, and Camilla, Duchess of Cornwall, toured the country, travelling to Queensland, Victoria, South Australia, New South Wales, and the Australian Capital Territory. Prince Harry toured The Bahamas. There, he attended a reception for youth leaders and met with Governor-General of the Bahamas Sir Arthur Foulkes. The Prince attended an outdoor ceremony where children's schools, clubs, and associations presented themselves and delivered a speech at Government House, where he stated "I stand before you with a deep sense of pride at being asked to convey to you a message of good wishes from The Queen on the occasion of her Diamond Jubilee." He also took part in maritime exercises organised by the Royal Bahamas Defence Force and toured Harbour Island. To mark Elizabeth II's 60 years as Barbados' monarch—as Queen of the United Kingdom between 1952 and 1966 and as Queen of Barbados thereafter—the country hosted the Queen's youngest son and his wife, the Earl and Countess of Wessex, between 23 and 24 February 2012. The tour began with the Earl and Countess arriving, aboard RFA Fort Rosalie, at the Deep Water Harbour of Bridgetown, where Barbadian military personnel were given inspection. To a joint sitting of the Parliament of Barbados, the Earl read a written message from the Queen, in which the monarch stated she has taken note of the level of development Barbados had achieved during its 45 years of independence and called the country a model small state for others around the world. Parliamentary officials responded with thanks to the Queen for her service to the country and Barbadians and invited her to the island to celebrate the 375th anniversary of the establishment of the Barbadian parliament in 2014. The visiting royal couple opened an exhibit at the University of the West Indies, Cave Hill Campus, and an official state dinner and reception was held at Government House in the evening. The following day, the Countess visited the Albert C. Graham Children's Development Centre at Ladymeade Gardens, while the Earl presented eight Duke of Edinburgh's Gold Awards to Barbadian youth at a dedication ceremony. Directly following, the couple travelled together to a ceremony to commemorate the Diamond Jubilee, where a plaque was unveiled at the Kensington Oval cricket stadium. Other events included the Earl and Countess lunching with Prime Minister Freundel Stuart at his residence, Ilaro Court, and touring several areas of Bridgetown that were added to UNESCO's list of World Heritage Sites in 2011. As in other Commonwealth realms, a set of commemorative Diamond Jubilee stamps were released by the Barbados Postal Service. An ecumenical thanksgiving service was held at the St. Mary's Anglican Church in Bridgetown on 3 June and a beacon lighting at the Garrison Savannah the following day, where an official Trooping of the Colour was performed by the Barbados Defence Force and military tattoo performed by the Royal Barbados Police Force. Members of the Barbados Boys Scout Association with high honours were chosen to aid in the actual beacon lighting. In Belize, the Governor-General-in-Council and the Belize Tourism Board organised a tour of the country by Prince Harry, between 2 and 3 March 2012, as part of the country's celebrations of Elizabeth II's 60th year as monarch of Belize, first as Queen of the United Kingdom and then, after 1981, as Queen of Belize. Harry visited Belmopan and San Ignacio where ceremonies and events had less emphasis on state protocol. In the capital, Harry unveiled a series of commemorative stamps issued by the Belize Postal Service, attended the city's street festival, and dedicated a street as Queen Elizabeth II Boulevard, where he delivered a speech on the sovereign's behalf. Forethought on the anniversary began as early as April 2007, when then-Secretary of State for Canadian Heritage Jason Kenney requested the various lieutenant governors begin preparations for the jubilee. Three years later, the question of a national holiday to mark the jubilee was raised in the media and a series of official announcements were made by the Minister of Canadian Heritage. The Secretary to the Queen, Kevin S. MacLeod, was charged by the Governor General-in-Council to head the Diamond Jubilee Committee (DJC)—a 14-member group of individuals drawn from the provincial and territorial governments, non-governmental organisations, officials from the Departments of Citizenship and Immigration, National Defence, and Canadian Heritage (DCH), and the Royal Canadian Mounted Police—that oversaw the organisation of the country's fêtes for Elizabeth II's 60 years as Queen of Canada. Similarly, Premier of Alberta Ed Stelmach in February 2011 tasked the Alberta Chief of Protocol and the Private Secretary to the Lieutenant Governor of Alberta to form and head a committee to develop plans for the province's Diamond Jubilee celebrations. As with other royal events, the DCH played a large role in organisation and planning. $7.5 million of resources, granted to the DCH in the previous budget approved by the federal parliament, was allocated for federal jubilee celebrations, education and awareness, and distribution to community groups; $2 million was for events in the Queen's honour and $3.7 million was allocated for the Diamond Jubilee medal. The total amount was reduced by Minister of Canadian Heritage James Moore from the DJC's original estimate of $8.8 million. The Queen, on 3 July 2010, dedicated the Queen Elizabeth II Gardens outside her official residence in Manitoba and there planted an Amber Jubilee Ninebark shrub, the cultivar having been created specifically for the Diamond Jubilee. 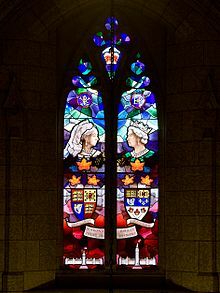 At Rideau Hall in Ottawa, she also, on 30 June, unveiled a commemorative stained glass window depicting herself and Queen Victoria with their respective royal cyphers and renditions of the Centre Block of the Canadian parliament during the reign of each monarch. The window, a gift from the Canadian Senate, was installed above the Senate entrance to the Centre Block and dedicated by Governor General David Johnston on 7 February 2012. A corbel within the Sovereigns' Arches of the Senate foyer was sculpted into a rendition of the Queen and unveiled on 9 December 2010 by the Governor General. The Royal Canadian Mint also issued an "extensive set" of coins to mark the anniversary. Further, the Royal Regiment of Canadian Artillery (RRCA) in 2011 presented the Queen, their captain-general since 1952, with a diamond and gold brooch, made by Birks & Mayors in the form of the regiment's cap badge, and announced the creation of The Captain General's Diamond Jubilee Bursary Award for educational activities of members of the RRCA and family. The royal standard of Elizabeth II, Queen of Canada, which was flown at various locations across Canada during Diamond Jubilee Week. Diamond Jubilee Week began on Accession Day (6 February) 2012. That day, the monarch's personal standard for Canada was unfurled at Rideau Hall and on Parliament Hill, as well as at provincial royal residences and legislatures across the country; permission was granted by the Queen to break the usual protocol of flying the banner only where the sovereign is physically present. At noon on the same day, the Peace Tower carillon played a tribute to Elizabeth II. [n 1] The Prime Minister and the leader of the Liberal Party of Canada issued statements commending the Queen for her six decades of "dedicated service to our country, to the Commonwealth and to the world." Also on 6 and 7 February, the first of the 60,000 Canadian Queen Elizabeth II Diamond Jubilee Medals to be distributed to citizens and permanent residents were handed out by lieutenant governors, commissioners, and other dignitaries across the country; 60 individuals were given theirs personally by the Governor General at Rideau Hall. All federal Members of Parliament (MPs) received the award automatically and a few refused, some because they belonged to the Quebec separatist Bloc Québécois, and one because he felt the money being spent by the Crown on jubilee events and markers was a waste. Citizens for a Canadian Republic claimed that day that the government's spending of money on the Queen's jubilee was to be expected "from the personality cult dynasties of North Korea or Syria". The Saint-Jean-Baptiste Society claimed it would stage "counter-celebrations". In Nova Scotia, the provincial government announced the establishment of educational programmes related to the Queen and her role in Canadian government and the one-time award of the $2000 Diamond Jubilee Award Scholarship to 60 Grade 12 students in the province. There and in other provinces and territories, various events were held on Accession Day, other days during Diamond Jubilee Week, and past its end. [n 2] The Speaker of the Senate, Noël Kinsella, and Speaker of the House of Commons, Andrew Scheer, were received by the Queen at Buckingham Palace on 21 February 2012, where they presented a loyal address to the sovereign. The Canadian Postal Museum also opened on 19 March the exhibition Designed for a Queen, which displayed 645 postal portraits of the Queen from Canada, other Commonwealth of Nations countries, and British Overseas Territories. Charles, Prince of Wales, and Camilla, Duchess of Cornwall, toured parts of the country in May, making stops in New Brunswick, Ontario, and Saskatchewan. In an editorial he wrote for The Globe and Mail, Charles stated he wanted his activities during the tour to reflect the jubilee's "central theme of service to others" and expressed that he was "returning to Canada in this special Jubilee year, to renew my own pledge of service and to encourage others to consider how they might contribute their own particular talent". In that vein, he in all three provinces visited with people associated with his organisation The Prince's Charities Canada and presented Diamond Jubilee Medals to recipients. The couple arrived at Saint John Airport on the evening of 20 May. The following day, they were formally welcomed by the Governor General and met at Canadian Forces Base Gagetown with young Canadian Forces veterans and mentors involved in the Military Entrepreneurship program before moving on to Saint John. There, they undertook a walking tour of Prince William Street to observe heritage projects and meet the 2002 Committee for the Prince of Wales Municipal Heritage Leadership Prize, participated in a citizenship ceremony, attended Victoria Day events, and opened the Diamond Jubilee IT Centre at Hazen-White-St. Francis School. They then flew on to Toronto to meet with emergency workers and their families and observe the annual fireworks show at Ashbridges Bay that marks Victoria Day and the Queen's official Canadian birthday. On 22 May, the couple attended an event hosted by the Lieutenant Governor of Ontario at Queen's Park. After, the Duchess visited The Queen's Own Rifles of Canada, of which she is colonel-in-chief, laying at the armoury a wreath in memory of fallen Canadian soldiers, while the Prince of Wales saw the Digital Media Zone at Ryerson University, toured the construction site of the athletes' village for the 2015 Pan American Games (where Premier of Ontario Dalton McGuinty announced a portion of Front Street running through the village would be named Diamond Jubilee Promenade), visited the Yonge Street Mission, and met with the national leadership of the Assembly of First Nations. The couple also attended a luncheon hosted by the government of Ontario and participated in a Canadian Forces event at Fort York commemorating the 200th anniversary of the War of 1812, the Prince there wearing his uniform of a lieutenant-general of the Canadian Army. They arrived in Regina on 23 May and marked the centenary of Saskatchewan's legislative building, participated in a reception held by the Lieutenant Governor of Saskatchewan at Government House, toured the First Nations University of Canada, and visited an environmentally friendly water purification plant. In the evening, the Prince and Duchess attended at the Royal Canadian Mounted Police (RCMP) Depot Division Drill Hall a performance of the Regina Symphony Orchestra, of which Prince Charles is patron. There, the Prime Minister announced that Charles was to be appointed Honorary Commissioner of the RCMP, taking the post from his mother, the Queen, who became the RCMP's Commissioner-in-Chief. New Democratic Party MP Pat Martin, an open anti-monarchist, stated in the House of Commons that the tour was "a bread-and-circuses routine" intended to distract from cuts to the federal civil service. The Minister of Canadian Heritage, James Moore, said the tour would be the "least expensive for taxpayers" of those that had taken place since 2009. At the Queen's request, members of the RCMP's Musical Ride, after performing in the Diamond Jubilee Pageant at Windsor Castle, took part in the Changing of the Guard on 23 May as they formed the Queen's Life Guard outside Buckingham Palace for 24 hours. Said by the contingent's commander to be a "way for Canada and the Mounties to salute her Majesty the Queen in her Diamond Jubilee year", it was the second time the RCMP had performed the task since doing so as a part of the Diamond Jubilee celebrations for Queen Victoria in 1897. We, Your Majesty's loyal and dutiful subjects, the House of Commons of Canada in Parliament assembled, beg to offer our sincere congratulations on the happy completion of the sixtieth year of Your reign. In this, the Diamond Jubilee year of your reign as Queen of Canada, we trust that Your gracious and peaceful reign may continue for many years and that Divine Providence will preserve Your Majesty in health, in happiness and in the affectionate loyalty of Your people. In the federal parliament on 31 May, a loyal address to the Queen was passed. The Lieutenant Governor of Manitoba held a Diamond Jubilee garden party at the province's Government House on 26 May. The Royal British Columbia Museum on 1 June opened an exhibition of approximately 100 Cecil Beaton photographs of Elizabeth II throughout her life. A team of Canadian and British mountaineers reached the summit of Mount Barbeau, in Canada's arctic, by 3 June and there held a tea party in celebration of the jubilee. From the summit, they sent a loyal greeting to the Queen via satellite, to which the monarch promised to reply. The next day, a group from the Royal Canadian Dragoons stationed in Afghanistan climbed with British soldiers to the peak of the 7,000 foot mountain Gharib Ghar, within the Kabul Military Training Center, "as part of the Diamond Jubilee celebrations for Queen Elizabeth II." In the United Kingdom, Canada House held a Big Jubilee Lunch on 3 June and two beacons were lit on the building's roof the following evening, the night of the Diamond Jubilee Concert. Johnston attended both events and Harper was at the latter. Another reception was held at Canada House on the evening of 6 June, at which the Governor General and Prince Andrew, Duke of York, were present. Harper was granted an audience with the Queen at Buckingham Palace on 5 June. Also at the palace, the Governor General, the Prime Minister, and the Queen unveiled a new portrait of the sovereign commissioned by the federal Crown-in-Council and painted by Canadian painter Phil Richards. The creation of the portrait became the subject of a National Film Board of Canada (NFB) documentary directed by Hubert Davis and released in the fall of 2012 as part of the NFB's Queen's Diamond Jubilee Collector's Edition. The painting was on 25 June installed in the ballroom at Rideau Hall. Dedicated at the same time by the Governor General were new bronze and glass handrails, with detailing evoking the Diamond Jubilee, flanking the ceremonial staircase in Rideau Hall's main entrance foyer. On 12 June 2012, the government of the Northwest Territories (NWT) and the City of Yellowknife held at the Northern Arts and Cultural Centre a garden party with barbecue, concert, and other activities. On 14 June, Amber Jubilee Ninebark shrubs were planted on the grounds of the NWT legislative assembly. Four days later, a gala concert was held at Roy Thomson Hall in Toronto, at which 600 diamond jubilee medals were awarded to members of the Order of Canada and Order of Ontario. The event, hosted by the Lieutenant Governor of Ontario, was attended by the Governor General and his wife and performers included the Famous People Players, Susan Aglukark, Molly Johnson, Ben Heppner, and Gordon Lightfoot, who conceived the idea of the event. The Lieutenant Governor of Saskatchewan held a garden party at Government House on Canada Day and, in the Northwest Territories, the Canada Day parade was themed to celebrate the jubilee and numerous jubilee medal presentation ceremonies took place. Also on 1 July, the Canadian Museum of Civilization opened the exhibit A Queen and Her Country, showing artefacts from the Crown Collection relating to Queen Elizabeth II and her role as Queen of Canada, including the Queen's Beasts from her coronation. At Rideau Hall on 11 September, a reception, attended by the Governor General; his wife; Prince Edward, Earl of Wessex; Sophie, Countess of Wessex; and others, was held for the Royal Victorian Order Association of Canada and to "honour of the 60th anniversary of Her Majesty Queen Elizabeth II’s accession to the Throne." The Earl also distributed Diamond Jubilee Medals to recipients in Toronto and to members of the RCMP in Iqaluit, Nunavut. The government of the NWT held through September an essay contest for youth to explain "how the Queen is important to First Nations and Métis people." A conference on the Canadian Crown was conducted in Saskatchewan on 25 October. The Governor General the following day unveiled a plaque identifying the Queen Elizabeth II Diamond Jubilee Trail, a part of the Trans Canada Trail between the West Block on Parliament Hill and the Supreme Court of Canada. In Nova Scotia, highway 106 was renamed as Jubilee Highway. Communities across Canada also held events to mark the jubilee, as did the federal government until the jubilee celebration ended on Accession Day 2013. Prince Harry toured Jamaica between 5 and 8 March 2012, participating in various events marking his grandmother's Diamond Jubilee as Jamaica's queen regnant, first as Queen of the United Kingdom, between 1952 and 1962, and subsequently as Queen of Jamaica (Jamaica will also thus be concurrently celebrating 50 years of independence). During the tour, the Prince partook in military exercises with the Jamaica Defence Force, visited Bustamante Hospital for Children and, in Trelawny Parish, visited Water Square, Falmouth Pier, and the William Knibb Baptist Church, where he paid respect at the William Knibb memorial. The Prince attended an event for the charity Rise Life, ran with Usain Bolt at the latter's training ground at the University of the West Indies, Mona. There, he was also named an Honorary Fellow of the university. A Jamaica Night reception was held at the Royal Caribbean Hotel in Montego Bay and Governor-General of Jamaica Sir Patrick Allen hosted a dinner at King's House as a combined celebration of the Diamond Jubilee and Jamaica's 50th anniversary of independence. The Prime Minister, Portia Simpson Miller, stated the tour was intended to "highlight the country's tourism developments on the North Coast and the important work being done in the area of youth and children." The Governor-General and his wife travelled to London, United Kingdom (UK), to partake in various events there in June, including a reception held by the High Commissioner of Jamaica to the UK. Jamaica's Diamond Jubilee celebrations proceeded despite Miller's ongoing work to have the country become a republic. Sir Jerry Mateparae, the Governor-General of New Zealand, unveiled New Zealand's Diamond Jubilee emblem on 27 November 2011 and announced at that time that a full programme would be forthcoming. New Zealand Post and the Reserve Bank of New Zealand stated in January 2012 the release a silver proof dollar coin to celebrate the Queen's Diamond Jubilee and, the following month, the Ministry for Culture and Heritage added Crown-related entries to Te Ara: The Encyclopedia of New Zealand and an essay on the jubilee to NZ.History.net.nz. The New Zealand post also issued sets of Diamond Jubilee stamps showing images of Queen Elizabeth II and Prince Philip throughout her reign. Prime Minister John Key moved a motion in the House of Representatives congratulating the Queen on her Diamond Jubilee on 7 February. The Governor-General-in-Council also launched, two days later, via the Ministry of Health, the Queen Elizabeth II Diamond Jubilee Research Grant, "seeking to purchase research projects that transfer knowledge from initiatives with proven effectiveness, into practice in the health sector". The New Zealand Army Band took part in the Diamond Jubilee Pageant held at Windsor Castle and also took part in the changing of guard ceremony at Buckingham Palace. In New Zealand, New Zealand Herald opinion columnist Jim Hopkins was critical of the jubilee celebrations held over the Queen's Birthday weekend, calling it a "missed opportunity". He was also critical of TVNZ's lack of jubilee related content in its daily news broadcast. A royal tour was undertaken by Charles, Prince of Wales, and Camilla, Duchess of Cornwall, between 10 and 16 November 2012. travelling to Auckland, Wellington, Christchurch, and Manawatu. Their programme is to focus on excellence and innovation in business, agriculture, community service, and sports, as well as children's literacy and animal health. Charles, Prince of Wales, and Camilla, Duchess of Cornwall, toured Papua New Guinea between 3 and 5 November. During their time in the country, the couple met church, charity, and community volunteers, cultural groups, and members of the Papua New Guinea Defence Force in and near Port Moresby. Prince William, Duke of Cambridge, and Catherine, Duchess of Cambridge, visited the Solomon Islands and Tuvalu. The Queen's realms throughout the Caribbean and West Indies planned a number of Diamond Jubilee events. Using RFA Fort Rosalie, Prince Edward, Earl of Wessex, and Sophie, Countess of Wessex, visited other Caribbean realms, including: Antigua and Barbuda, Grenada, Montserrat and Saint Lucia. Historical re-enactments were put on in Saint Kitts and Nevis for the Earl and Countess of Wessex, who arrived on 3 March 2012. There, the couple met with Governor-General Sir Cuthbert Sebastian, Prime Minister Denzil Douglas, and other dignitaries, watched cultural shows (including the performance of a calypso song about the Queen), and the Earl unveiled a plaque commemorating the Diamond Jubilee and officially designated the Basseterre Valley Park as the Royal Basseterre Valley Park. They also visited Brimstone Hill Fortress National Park and the children's ward of the JNF Hospital and the Children's Home before attending a state dinner and fireworks display at Port Zante. 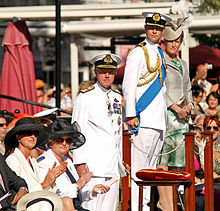 The Earl and Countess of Wessex arrived in Saint Lucia on 21 February 2012 and there participated in Independence Day celebrations and attended receptions held by the Governor-General of Saint Lucia. They also visited the Association of Saint Lucia and the Saint Lucia School of Music. In Saint Vincent and the Grenadines, a Diamond Jubilee Celebrations Committee was established to oversee events staged to mark, between February and June 2012, the Diamond Jubilee of Elizabeth II's accession as queen regnant of the country, from 1952 to 1979 as Queen of the United Kingdom and thereafter as Queen of Saint Vincent and the Grenadines. The committee head, former Minister of Culture Rene Baptiste, stated the aim was to "showcase what we have to offer, as well as our loyalty to the Parliament..." The Earl and Countess of Wessex, aboard RFA Fort Rosalie, arrived for their tour of country on 25 February and visited the restored Botanic Gardens St. Vincent and planted a Pink Poui tree, attended an official lunch at Government House, and planted Royal Palms on the Grenadines. Trade unionist Noel Jackson said he heard displeasure expressed by Vincentians towards the royal tour and that "a lot of people were cursing." Senator Julian Francis, the General Secretary of the governing Unity Labour Party, stated the public reaction to the presence of the royal couple "confirmed to me that we could not have won the 2009 referendum on a republic. The outpouring of the people in St. Vincent to come and greet Prince Edward yesterday confirmed to me that people, in the majority in St. Vincent, still want the monarchy... It was like a carnival in town yesterday." A Diamond Jubilee Lecture was delivered in March, a flower show and tea party was held at Government House on 4 and 5 May, a stamp exhibition was mounted at the National Trust headquarters and an exhibition of photographs of the Queen in Saint Vincent and the Grenadines was displayed at the National Public Library. A Queen's Birthday parade took place, as did a Diamond Jubilee Beacon Event on 4 June, part of the wider plan to light such beacons at the same time across the Commonwealth. In the United Kingdom, national and regional events to mark the Diamond Jubilee were coordinated by the Queen-in-Council and her Royal Household at Buckingham Palace. As with the Golden Jubilee in 2002, the Department for Culture, Media and Sport was responsible for coordinating the Cabinet-led aspects of the celebrations. Events were planned so as to keep the use of tax money to a minimum; most funds used to fund celebrations were drawn from private donors and sponsors. Only the cost of security was by Her Majesty's Treasury. The British logo for the Diamond Jubilee was selected through a contest held by the BBC children's programme Blue Peter; the winning design, announced in February 2011, was created by ten-year-old Katherine Dewar. .
On 5 January 2010, the Lord President of the Council and Business Secretary Lord Mandelson announced that an extra bank holiday would take place on 5 June 2012. Moving the Spring Bank Holiday (the last Monday in May) to 4 June resulted in a four-day holiday in honour of the Diamond Jubilee. As national holidays are a devolved matter, Scotland's first minister confirmed that the bank holiday would be held on 5 June in Scotland. Some economists later theorised that the holiday could reduce the country's gross domestic product by 0.5% in the second quarter of the year, though this would be partially offset by increased sales for the hospitality and merchandise sectors. Many events were staged in London during the bank holiday weekend. The River Thames Diamond Jubilee Pageant was held on 3 June; a maritime parade of 1,000 boats from around the Commonwealth—the largest flotilla seen on the river in 350 years—together with other celebrations along the river banks. Heavy rain started during the event and the commemorative airforce flyover at the end was cancelled due to very low cloud base and bad visibility at ground level. Along with almost all members of the Royal Family, various governors-general from the Commonwealth realms other than the UK were in attendance. The Diamond Jubilee Concert, with a preceding afternoon picnic in the palace gardens for the 10,000 concert ticket holders, was held the following day, in front of Buckingham Palace, and featured acts representing each decade of the Queen's 60-year reign. Street parties were permitted to take place across the country. Special community lottery grants, called The Jubilee People's Millions, are being offered by the Big Lottery Fund and ITV. Members of the Royal Family, governors-general, and prime ministers from the Commonwealth realms were present at various functions held on 4 and 5 June: A reception took place at Buckingham Palace before the Diamond Jubilee Concert and a service of thanksgiving was conducted the following day at St. Paul's Cathedral, also attended by 2,000 other guests. Will Todd's anthem "The Call of Wisdom", commissioned specially for this event, was performed by the Diamond Choir, made up of about 40 children from around the UK. The Archbishop of Canterbury dedicated his sermon to the Queen, during which he noted her "lifelong dedication" and stated that she "has made her 'public' happy and all the signs are that she is herself happy, fulfilled and at home in these encounters." Afterwards, a formal lunch was held in Westminster Hall. The Queen returned to Buckingham Palace at 2:20 pm, in an open top carriage procession and escorted by The Household Cavalry Regiment. Another reception was held at London's Guildhall and a luncheon took place at Lancaster House, hosted by the British Secretary of State for Foreign and Commonwealth Affairs. A reception solely for governors-general was held by the Queen at Buckingham Palace. The weekend of celebrations ended with a balcony appearance at Buckingham Palace. The Queen appeared on the balcony with the Prince of Wales, the Duchess of Cornwall, the Duke of Cambridge, the Duchess of Cambridge, and Prince Harry in front of cheering crowds outside the palace and along The Mall. There followed a feu de joie and a flypast by the Red Arrows and historic aircraft, including the last flying Lancaster bomber in Britain. Several media commentators commented on the significance of only senior members of the royal family appearing on the balcony. BBC royal correspondent Peter Hunt remarked that it "sent a message demonstrating both continuity and restraint at a time of austerity". To mark the jubilee, the Queen bestowed Royal Borough status on Greenwich, in southeast London. In addition, a competition was held to grant in 2012 city status to towns and either a lord mayoralty or lord provostship to one city. [n 3] City status was awarded to Chelmsford in England, Perth in Scotland and St Asaph in Wales. Armagh, Northern Ireland, was awarded the Lord Mayoralty. The Olympic park in East London, created for the 2012 London Olympics, was named the Queen Elizabeth Olympic Park following the Olympics. The Queen Elizabeth II Fields Challenge (Queen Elizabeth Fields Challenge in Scotland) was a project of the charity Fields in Trust to safeguard parks and green spaces as public recreation land in perpetuity for future generations to enjoy, and to provide a permanent legacy of the Diamond Jubilee and the Olympics. The Woodland Trust planned to establish 60 Jubilee woodlands during 2011 and 2012, one of almost 500 acres – Flagship Diamond Wood, Leicestershire – and the remainder 60 acres each. A stained glass window, paid for by MPs and members of the House of Lords, was unveiled in the Queen's presence at Westminster Hall in March 2012. In addition, a majority of MPs endorsed the renaming of the clock tower of Westminster Palace that houses Big Ben, to the Elizabeth Tower. The Royal Jubilee Bells, made for the Jubilee and a feature of the Thames Diamond Jubilee Pageant, were delivered to the church of St James Garlickhythe in the City of London on 15 June 2012 and arranged along the central aisle. They were dedicated by the Rt Revd John Waine on Sunday 17 June and hanging commenced in the tower shortly thereafter. They were rung for the first time in the church on 4 July. The Royal Mint issued a number of coins including an official £5 coin, a 5oz coin and a kilo coin. A five-pound sterling silver coin was issued by the Government of Gibraltar to mark the occasion. In October 2012 it was announced that the Queen would bestow the honorary title of Regius Professorship to up to six university chairs in the United Kingdom, to recognise "excellence in teaching and research"; the number was chosen to represent the decades of the Queen's reign. The full list was announced on 29 January 2013 and comprised twelve new chairs, in recognition of the "exceptionally high quality" of the departments considered. Kew Gardens announced that the Main Gate, the entrance to the gardens from Kew Green, was to be renamed Elizabeth Gate in honour of the Queen. Princess Alexandra attended the naming ceremony on 21 October 2012. On 18 December 2012, the British Foreign Office announced that a portion of the British Antarctic Territory was to be named Queen Elizabeth Land in honour of Her Majesty in her diamond jubilee year. A seemingly less permanent tribute that gained widespread popularity was a work provided by street artist Banksy. His "Slave Labour" stencil on a north London wall offered pointed criticism of the jubilee celebrations and the conditions that support British nationalism. The mural's removal and subsequent attempted sale at auction in February 2013 sparked international controversy, highlighting the piece's worth to local and regional residents. Its title, perhaps coincidentally, conjured another contentious part of the celebrations where unemployed workers, bussed into London on an allegedly unpaid trial to staff security for the event, were made to work under what some described as "appalling" conditions. On Accession Day, 6 February, a 62-gun salute was mounted on the banks of the River Thames, near the Tower of London and the Queen made a visit to Norfolk, one of the first places the monarch visited after acceding to the throne. Later in the month, Queen Elizabeth attended a multi-faith (Bahá'í, Buddhist, Christian, Hindu, Jain, Jewish, Muslim, Sikh, and Zoroastrian) reception held at the residence of the Archbishop of Canterbury, Lambeth Palace, in honour of the jubilee. The Queen addressed both houses of parliament in Westminster Hall on 20 March 2012. Also in March, the Royal Commonwealth Society launched the Jubilee Time Capsule to mark the jubilee. The British Broadcasting Corporation and Andrew Marr created the television documentary The Diamond Queen, in which various members of the Royal Family and current and former politicians spoke about the Sovereign and her life. The documentary was criticised by the campaign group Republic, which argued that it breached BBC guidelines on impartiality. At Buckingham Palace, a display of the Queen's diamonds was opened to the public. On 4 June, the bells in each of the 34 church bell towers along the River Welland valley rang in succession, ending with the ringing of the bell at Fosdyke 60 times. On 19 May, the Queen attended the Diamond Jubilee Armed Forces Parade and Muster, the British Armed Forces' own tribute to the monarch, in Windsor Castle and nearby Home Park. The first time all three services had assembled for the Queen for such an event at the same time, it featured military reviews and a 2,500 strong military parade through the town, as well as a military flypast featuring 78 aircraft. Prince Richard, Duke of Gloucester, toured the British Virgin Islands (BVI) in March 2012. On Montserrat, he met participants in the Sailability BVI programme, including Special Olympics medallists, and staff and associates of the Eslyn Henley Ritchie Learning Centre, BVI Technical and Vocational Institute, BVI Services, and the Department of Youth Affairs and Sports. Prince Edward, Earl of Wessex, and Sophie, Countess of Wessex, visited the British Overseas Territory of Gibraltar, between 11–13 June 2012, and Montserrat.[when?] The Spanish Ministry of Foreign Affairs and Cooperation expressed "upset and concern" about the couple's tour of Gibraltar, which Spain claims as Spanish territory. Visits were planned by Princess Anne to Zambia and Mozambique, while the Duke of Gloucester made official visits to Uganda and Malta. In Asia, Prince Andrew, Duke of York, visited India, while Prince William, Duke of Cambridge, and Catherine, Duchess of Cambridge, visited Malaysia, Singapore, and the Solomon Islands. Prince Edward, Earl of Wessex, and Sophie, Countess of Wessex, visited Trinidad and Tobago, as did Governor General of Canada David Johnston. The British Consulate in Cape Town, in conjunction with the Hout Bay and Llandudno Heritage Trust, hosted a firing of ancient muzzle-loading cannons at East Fort in Hout Bay. The Hout Bay and Llandudno Heritage Trust restored the Fort's original Swedish made 18 pounder muzzle-loading cannons, dating from 1752, and fired two rolling salvo salutes, of six cannon shots each, in the Queen’s honour and in recognition of the bond of friendship between South Africa and Great Britain. The South African Navy Band was in attendance and the guns were fired by VIPs who were guided by gunners of the "Honourable Order of Hout Bay Artillerymen". At the Victoria and Alfred Waterfront of the Port of Cape Town, a flotilla from the Royal Cape Yacht Club sailed past the Hildebrand Ristorante and into-the Victoria Basin and the Cape Town Highlanders marched from Ferryman's to Nobel Square. British Consul General Chris Trott lit a beacon, followed by a further six-gun salute and both South African national anthem and "God Save the Queen". Hong Kong, a British dependent territory until 1997 and the most populous one, had The Big Jubilee Lunch on 3 June 2012, organised by the Royal Commonwealth Society in Hong Kong. On 5 June 2012, there was a service of thanksgiving at the territory's Anglican Cathedral Church of St. John the Evangelist. ^ This included the tunes "O Canada", "Westminster" (for carillon), "Jerusalem", "This Canada of Ours", "Andante" (from Sonata for 47 Bells), and "God Save the Queen". ^ Gordie Gosse, the Speaker of the House of Assembly of Nova Scotia, held a youth event at Province House. Lieutenant Governor of British Columbia Steven Point hosted a tea and later formal reception at Government House. A public official reception was held by the territorial commissioner at the Legislative Assembly of the Northwest Territories on 7 February, at which a pictorial display with the theme of past royal tours of the territory was opened. A ceremony, attended by the Lieutenant Governor, Premier, and parliamentary officials was held in conjunction with the opening of the British Columbia legislature on 14 February. And Lieutenant Governor of Ontario David Onley mounted at the viceregal suite at the Ontario Legislative Building an exhibition entitled 60 in 60, to "show six decades of Her Majesty's devotion and service to Canada." ^ The towns that bid for city status were: Bolton, Bournemouth, Chelmsford, Colchester, Coleraine, Corby, Craigavon, Croydon, Doncaster, Dorchester, Dudley, Dumfries, Gateshead, Goole, Luton, Medway, Middlesbrough, Milton Keynes, Perth, Reading, Southend, St Asaph, St Austell, Stockport, Tower Hamlets, and Wrexham. The cities that bid for a Lord Mayoralty or Lord Provostship were: Armagh, Cambridge, Derby, Gloucester, Lancaster, Newport, Peterborough, Salford, Southampton, St Albans, Sunderland, and Wakefield. ^ Royal Household (6 February 2012). "The Queen's Diamond Jubilee message". Queen's Printer. Archived from the original on 11 February 2012. Retrieved 8 February 2012. ^ a b c d "The Queen Elizabeth Diamond Jubilee Trust" (Press release). Australian Government Publishing Service. 7 February 2012. Archived from the original on 6 June 2012. Retrieved 11 February 2012. ^ "NZ to give $1m to Diamond Jubilee". MSN NZ. 20 February 2012. Archived from the original on 25 May 2013. Retrieved 20 February 2012. ^ "Charles, Camilla to visit Canada in May; Chretien named envoy". CTV. 30 April 2012. Archived from the original on 1 May 2012. Retrieved 30 April 2012. ^ "Windsor reveals 'spectacular' plans for Diamond Jubilee". BBC. 1 November 2011. Archived from the original on 25 April 2012. Retrieved 21 April 2012. ^ "Queen's lunch for monarchs attracts controversy". BBC. 18 May 2012. Archived from the original on 22 May 2012. Retrieved 23 May 2012. ^ "Tonga's guides and scouts light first Diamond Jubilee beacon". Matangi Tonga. 4 June 2012. Archived from the original on 7 June 2012. Retrieved 5 June 2012. ^ "Burning aliens for the Queen". Birdwatch. 4 June 2012. Archived from the original on 8 June 2012. Retrieved 5 June 2012. ^ "The Queen's Diamond Jubilee Beacons > Beacon Lighting Times". Queen's Printer. Archived from the original on 7 May 2012. Retrieved 9 May 2012. ^ Rainey, Sarah (3 May 2012). "Diamond Jubilee will set the globe alight". canada.com. Archived from the original on 17 June 2014. Retrieved 28 May 2012. ^ Bowater, Donna (5 June 2012). "The Queen's Diamond Jubilee Concert: Loudest cheer for the Duke of Edinburgh". Daily Telegraph. Archived from the original on 20 June 2012. Retrieved 24 June 2012. ^ "Prince Philip 'feeling better'". BBC. 5 June 2012. Archived from the original on 17 June 2012. Retrieved 24 June 2012. ^ "Queen visits Prince Philip in hospital". BBC. 6 June 2012. Archived from the original on 18 June 2012. Retrieved 24 June 2012. ^ "Diamond jubilee: Queen "humbled by experience"". BBC. 5 June 2012. Archived from the original on 17 June 2012. Retrieved 24 June 2012. ^ Office of the Governor General of Australia. "Queen's Birthday Message". Australian Government Publishing Service. Archived from the original on 14 March 2012. Retrieved 15 July 2011. ^ Royal Australian Mint. "2012 Product Launch for the Royal Australian Mint" (PDF). Royal Australian Mint. Archived from the original (PDF) on 24 November 2011. Retrieved 18 September 2011. ^ Hardman, Robert (31 May 2012). "Charles and Camilla meet 28 living VCs and GCs ahead of Diamond Jubilee". Daily Mail. Associated Newspapers Ltd. Archived from the original on 1 June 2012. Retrieved 7 June 2012. ^ a b c d "Royal Family plans for Queen's Diamond Jubilee unveiled". BBC. 14 December 2011. Archived from the original on 14 December 2011. Retrieved 14 December 2011. ^ Lynch, Sharon (25 January 2012). "Royal Visit To Mark Queen's Diamond Jubilee". Barbados Government Information Service (BGIS). Archived from the original on 29 January 2016. Retrieved 7 February 2012. ^ "Red carpet welcome for Royal Couple". Caribbean360. 24 February 2012. Archived from the original on 2 March 2012. Retrieved 25 February 2012. ^ Esther Byer-Suckoo (21 February 2012). Barbadian Minister Esther Byer-Suckoo briefs Press on the Royal Visit (Video). Bridgetown: News Distribution Network. Retrieved 24 February 2012. ^ Carrington, J. (24 February 2012). "Queen Elizabeth II Proud of Barbados' Achievements". Barbados Government Information Service. Archived from the original on 6 May 2012. Retrieved 24 February 2012. ^ Carrington, Julie (23 February 2012). "Barbados Grateful To Her Majesty Queen Elizabeth II". Barbados Government Information Service. Archived from the original on 6 May 2012. Retrieved 24 February 2012. ^ TRH (23 February 2012). "VIDEO: The Earl and Countess of Wessex Prince Edward and his wife Sophie, visit Parliament and Cave Hill Campus". The Daily Nation. Retrieved 24 February 2012. ^ "Barbados: Now Available: Queen Elizabeth II Diamond Jubilee Commemorative Stamp Issue". Barbados Postal Service. Archived from the original on 18 November 2012. Retrieved 18 November 2012. ^ "Diamond Jubilee: Prince Harry visits Mayan ruins in Belize". BBC. 3 March 2012. Archived from the original on 5 March 2012. Retrieved 6 March 2012. ^ "Diamond Jubilee: should we get a national holiday?". CBC. 6 January 2010. Archived from the original on 11 August 2010. Retrieved 4 June 2010. ^ a b c The Canadian Press (9 January 2012). "Conservatives balked at cost of Queen's Diamond Jubilee". CBC. Retrieved 2 March 2012. ^ "PM announces the appointment of Kevin MacLeod as Canadian Secretary to the Queen" (Press release). Office of the Prime Minister. 1 April 2009. Archived from the original on 5 April 2009. Retrieved 29 November 2009. ^ Government of Alberta (3 February 2011). "Planning launches for Alberta's Diamond Jubilee celebrations". Queen's Printer for Alberta. Retrieved 29 January 2012. ^ Department of Canadian Heritage. "2010 Royal Tour > Itinerary for 2010 Royal Tour of Canada". Queen's Printer for Canada. Archived from the original on 19 June 2010. Retrieved 9 August 2010. ^ Parliament of Canada. "The Diamond Jubilee Window: A Celebration of the Crown in Canada". Queen's Printer for Canada. Archived from the original on 12 March 2012. Retrieved 15 April 2012. ^ Foot, Richard (29 June 2010). "Queen Elizabeth in Halifax". Global News. Archived from the original on 7 June 2011. Retrieved 1 July 2010. ^ Office of the Governor General of Canada (6 February 2012). "Governor General to Attend the Dedication Ceremony of the Diamond Jubilee Window in Senate Foyer". Queen's Printer for Canada. Retrieved 9 February 2012. ^ Office of the Governor General of Canada (7 December 2010). "Governor General to Unveil the Corbel of Her Majesty Queen Elizabeth II". Queen's Printer for Canada. Retrieved 7 December 2010. ^ "Her Majesty the Queen Receives a Brooch Produced by Canadian Jeweller Birks in Honour of her Diamond Jubilee as Captain General of the Royal Regiment of Canadian Artillery". Canada Newswire. 14 December 2011. Archived from the original on 14 June 2012. Retrieved 15 June 2012. ^ Office of the Lieutenant Governor of Nova Scotia (23 January 2012). "Media > News and Events > Diamond Jubilee Events". Queen's Printer for Nova Scotia. Archived from the original on 4 March 2012. Retrieved 16 February 2012. ^ "Manitoba Celebrating Queen's Diamond Jubilee". ChrisD. 6 February 2012. Retrieved 6 February 2012. ^ a b Office of the Lieutenant Governor of Prince Edward Island (3 February 2012). "Diamond Jubilee Celebrations Begin". Queen's Printer for Prince Edward Island. Archived from the original on 6 June 2012. Retrieved 29 February 2012. ^ a b c d e f Northwest Territories Executive. "Department of Executive > Offices of the Executive > Protocol > NWT Jubilee Events". Government of the Northwest Territories Publications. Archived from the original on 3 July 2013. Retrieved 26 July 2012. ^ a b "Canada kicks off festivities for Queen's jubilee". CTV. 6 February 2012. Archived from the original on 18 March 2012. Retrieved 6 February 2012. ^ a b Parliament of Canada. "The House of Commons Heritage Collection > Carillon > Programme". Queen's Printer for Canada. Archived from the original on 4 May 2012. Retrieved 6 February 2012. ^ Rae, Bob (6 February 2012). "Statement by Liberal Leader Bob Rae on the Queen's Diamond Jubilee". Liberal Party of Canada. Archived from the original on 15 February 2012. Retrieved 26 February 2012. ^ Harper, Stephen (6 February 2012). "The Queen's Diamond Jubilee: a Canadian celebration". Queen's Printer for Canada. Archived from the original on 8 August 2012. Retrieved 26 February 2012. ^ Duchense, Pierre (6 February 2012). "Allocution de Son Honneur l'honorable Pierre Duchesne, lieutenant-gouverneur du Québec, à l'occasion de la cérémonie de remise de la Médaille du jubilé de diamant de Sa Majesté la reine Elizabeth II" (in French). Bureau du Lieutenant-gouverneur du Québec. Archived from the original on 21 May 2013. Retrieved 29 June 2012. ^ Office of the Governor General of Canada (6 February 2012). "Sixty Canadians are Honoured During the Inaugural Presentation Ceremony of the Diamond Jubilee Medal at Rideau Hall". Queen's Printer for Canada. Retrieved 6 February 2012. ^ "Jubilee celebrations raise questions of priorities" (Press release). Citizens for a Canadian Republic. 6 February 2012. Retrieved 9 February 2012. ^ Government of Nova Scotia. "The Diamond Jubilee of Her Majesty Queen Elizabeth II > Diamond Jubilee Education Initiatives". Queen's Printer for Nova Scotia. Archived from the original on 4 June 2012. Retrieved 29 February 2012. ^ Government of Nova Scotia. "The Diamond Jubilee of Her Majesty Queen Elizabeth II > Diamond Jubilee Photos". Queen's Printer for Nova Scotia. Archived from the original on 3 June 2013. Retrieved 29 February 2012. ^ a b "Diamond Jubilee Celebration Held At BC Legislature". 680 News. 14 February 2012. Archived from the original on 31 January 2013. Retrieved 2 March 2012. ^ Office of the Lieutenant Governor of Ontario. "60 in 60". Queen's Printer for Ontario. Archived from the original on 17 May 2012. Retrieved 6 May 2012. ^ Royal Household. "Court Circular > 21 February 2012". Queen's Printer. Archived from the original on 29 February 2012. Retrieved 25 February 2012. ^ "Exhibitions > Special Exhibitions > Designed for a Queen: Celebrating the 60-year Reign of Queen Elizabeth II through Stamps". Canadian Museum of Civilization. Archived from the original on 11 May 2012. Retrieved 28 June 2012. ^ Office of the Governor General of Canada (14 December 2011). "Their Royal Highnesses The Prince of Wales and The Duchess of Cornwall to Undertake a Royal Tour of Canada in 2012". Queen's Printer for Canada. Archived from the original on 14 October 2014. Retrieved 14 December 2011. ^ a b c d Department of Canadian Heritage. "Topics > Monarchy in Canada > 2012 Royal Tour > 2012 Royal Tour Itinerary". Queen's Printer for Canada. Archived from the original on 21 May 2014. Retrieved 11 May 2012. ^ "Prince Charles, Camilla head to Regina after Toronto tour". CTV. 22 May 2012. Archived from the original on 25 May 2012. Retrieved 23 May 2012. ^ Department of Canadian Heritage (30 April 2012). "The Department > Newsroom > Government of Canada Unveils Details of the 2012 Royal Tour". Queen's Printer for Canada. Archived from the original on 28 June 2013. Retrieved 5 May 2012. ^ a b "Mounties guard the Queen in London for a day". CTV. 23 May 2012. Archived from the original on 25 May 2012. Retrieved 25 May 2012. ^ "Canada's Mounties guard Buckingham Palace". AFP. 24 May 2012. Retrieved 25 May 2012. ^ "The Diamond Jubilee: Schedule of events". CTV. 14 May 2012. Archived from the original on 18 May 2012. Retrieved 28 May 2012. ^ "Adventurers to celebrate Queen's Jubilee atop Arctic peak". CBC. 22 May 2012. ^ "The Changing Role of Dragoons in Afghanistan". Royal Canadian Dragoons. Archived from the original on 21 July 2012. Retrieved 16 July 2012. ^ High Commission of Canada to the United Kingdom. "Canada celebrates Her Majesty's Diamond Jubilee". Queen's Printer for Canada. Archived from the original on 5 May 2012. Retrieved 28 May 2012. ^ a b c d Office of the Governor General of Canada (1 June 2012). "The Central Weekend – Queen's Diamond Jubilee". Queen's Printer for Canada. Retrieved 4 June 2012. ^ Johnston, David (6 June 2012). "Reception with the Business Community". Queen's Printer for Canada. Retrieved 22 June 2012. ^ Vlessing, Etan (5 June 2012). "National Film Board puts final touches to "The Portrait"". Realscreen. Archived from the original on 2 April 2015. Retrieved 16 June 2012. ^ Davis, Hubert (director). "The Portrait". Documentary film. National Film Board of Canada. Archived from the original on 17 October 2012. Retrieved 13 October 2012. ^ Office of the Governor General of Canada (25 June 2012). "Her Majesty The Queen's New Painting Arrives at Rideau Hall". Queen's Printer for Canada. Retrieved 28 June 2012. ^ "Diamond Jubilee Gala toasts exceptional Canadians". CBC. 18 June 2012. Archived from the original on 19 June 2012. Retrieved 19 June 2012. ^ Government of Saskatchewan. "Events > Garden Party". Queen's Printer for Saskatchewan. Retrieved 7 May 2012. ^ "Exhibitions > Special Exhibitions > A Queen and Her Country". Canadian Museum of Civilization. Archived from the original on 25 June 2012. Retrieved 28 June 2012. ^ Office of the Governor General of Canada (10 September 2012). "Working Visit to Canada by The Earl and Countess of Wessex". Queen's Printer for Canada. Retrieved 12 September 2012. ^ Schwass-Bueckert, Kate (11 September 2012). "Prince Edward, Sophie kick off tour". Canoe. Archived from the original on 15 January 2013. Retrieved 16 September 2012. ^ "Royals commend RCMP officers in Iqaluit". CBC. 13 September 2012. Archived from the original on 16 September 2012. Retrieved 16 September 2012. ^ Government of Saskatchewan. "Events > Conference on the Crown". Queen's Printer for Saskatchewan. Archived from the original on 10 July 2012. Retrieved 7 May 2012. ^ Office of the Governor General of Canada (24 October 2012). "Governor General to Unveil New Plaque in Honour of the Naming of The Queen Elizabeth II Diamond Jubilee Trail". Queen's Printer for Canada. Retrieved 25 October 2012. ^ Government of Nova Scotia (21 December 2012). "Highway Naming Commemorates 60-year Reign". Queen's Printer for Nova Scotia. Archived from the original on 20 December 2013. Retrieved 21 December 2012. ^ "London Celebrates Canada" (PDF). City of London. Archived (PDF) from the original on 5 September 2012. Retrieved 6 May 2012. ^ "Events > Upcoming Events > Queen's Jubilee & Mother's Day Royal Tea". Museums of Burlington. Archived from the original on 5 June 2012. Retrieved 5 May 2012. ^ "Queen's Diamond Jubilee: The Queen". Metro Cinema. Archived from the original on 5 August 2012. Retrieved 5 May 2012. ^ "List of Diamond Jubilee events". Monarchist League of Canada. Archived from the original on 14 April 2012. Retrieved 5 May 2012. ^ Government of Prince Edward Island. "The Diamond Jubilee: A Prince Edward Island Celebration > Community Events". Queen's Printer for Prince Edward Island. Archived from the original on 25 October 2012. Retrieved 16 September 2012. ^ a b "Preparations underway for Prince's visit". Go-Jamaica. 7 February 2012. Archived from the original on 10 February 2012. Retrieved 11 February 2012. ^ Governor-General of New Zealand. "Queen's Diamond Jubilee Emblem of New Zealand". Governor-General of New Zealand. Archived from the original on 18 December 2011. Retrieved 29 November 2011. ^ Office of the Governor-General of New Zealand. "Queen's Diamond Jubilee Emblem of New Zealand". Government Printing Office. Archived from the original on 18 December 2011. Retrieved 29 November 2011. ^ New Zealand Post. "2012 Queen Elizabeth II Diamond Jubilee Silver Proof Coin". Government Printing Office. Archived from the original on 1 February 2012. Retrieved 1 February 2012. ^ "2012 Queen Elizabeth II Diamond Jubilee". New Zealand Post Stamps. Archived from the original on 22 February 2014. ^ Parliament of New Zealand. "Motions – Queen Elizabeth II – Diamond Jubilee". Government Printing Office. Archived from the original on 4 March 2013. Retrieved 10 February 2012. ^ Health Research Council of New Zealand (9 February 2012). "Queen Elizabeth II Jubilee Research Grant – Health Knowledge to Action". Government Printing Office. Archived from the original on 13 February 2012. Retrieved 19 February 2012. ^ a b "Shame we blew Queen's Jubilee". New Zealand Herald. 8 June 2012. Retrieved 30 July 2012. ^ Office of the Prime Minister of New Zealand (6 February 2012). "PM marks beginning of Diamond Jubilee year" (Press release). Government Printing Office. Archived from the original on 7 February 2012. Retrieved 6 February 2012. ^ Staff writer (14 December 2011). "Diamond Jubilee: Royal Family will visit every Realm". The Daily Telegraph. UK. Archived from the original on 10 February 2012. Retrieved 5 February 2012. ^ "Dramatic historical re-enactments to mark Diamond Jubilee celebration". SKNVibes. 17 February 2012. Archived from the original on 25 February 2012. Retrieved 19 February 2012. ^ "St Lucia celebrates 33 years of Independence". NationNews. 22 February 2012. Archived from the original on 2 December 2013. Retrieved 23 February 2012. ^ "Majority of Vincentians 'still want the monarchy'". I-Witness News. 27 February 2012. Archived from the original on 1 March 2012. Retrieved 28 February 2012. ^ a b "The Queen: Don't link my Jubilee celebration to 'flashy' Olympics". Daily Mail. London. 27 June 2009. Archived from the original on 14 January 2013. Retrieved 31 October 2010. ^ "Queen's Diamond Jubilee emblem revealed". BBC News. 21 February 2011. Archived from the original on 21 February 2011. Retrieved 21 February 2011. ^ Royal Household (11 February 2011). "Diamond Jubilee emblem unveiled". Queen's Printer. Archived from the original on 15 February 2012. Retrieved 10 February 2012. ^ a b c "Extra bank holiday to mark Jubilee". Press Association. 5 January 2010. Archived from the original on 5 January 2010. Retrieved 5 January 2010. ^ "Extra Bank holiday to mark Queen's Diamond Jubilee". Department for Business Innovation & Skills. 5 January 2010. Archived from the original on 6 January 2010. Retrieved 6 January 2010. ^ a b "Extra holiday for 2012 Jubilee". Reuters. 5 January 2010. Archived from the original on 5 January 2010. Retrieved 5 January 2010. ^ "'Diamond Jubilee Could Harm The Economy'". Sky News. 6 February 2012. Archived from the original on 7 February 2012. Retrieved 6 February 2012. ^ "Welcome". Diamond Jubilee. Archived from the original on 7 April 2011. Retrieved 7 April 2011. ^ "London river extravaganza planned for Queen's jubilee". France 24. 6 April 2011. Archived from the original on 26 January 2012. Retrieved 7 April 2011. ^ "Sir Paul McCartney to play Queen Diamond Jubilee gig". BBC News. BBC. 7 February 2012. Archived from the original on 19 May 2012. Retrieved 20 April 2012. ^ "Andrew Lloyd Webber and Gary Barlow write Jubilee song". BBC News. BBC. 24 February 2012. Archived from the original on 18 April 2012. Retrieved 20 April 2012. ^ "Heston Blumenthal plans 'best of British' Jubilee picnic". BBC News. BBC. 18 April 2012. Archived from the original on 19 April 2012. Retrieved 20 April 2012. ^ Department for Communities and Local Government. "The new, simple, easy-to-use form to organise street parties has arrived!". Queen's Printer. Archived from the original on 2 February 2011. Retrieved 19 February 2011. ^ "Lottery Millions to Help Communities Bloom for Diamond Jubilee". The National Lottery. Archived from the original on 5 March 2011. Retrieved 19 February 2011. ^ "Queen celebrates Jubilee at St Paul's". St Paul's Cathedral. Archived from the original on 21 September 2013. Retrieved 20 September 2013. ^ "OUP: Diamond Jubilee anthem by Will Todd". Oxford University Press. Archived from the original on 6 June 2013. Retrieved 3 May 2012. ^ "Diamond Choir: Meet the Choir". St. Paul's Cathedral. Archived from the original on 23 July 2013. ^ "Dr Williams pays tribute to the Queen at thanksgiving". BBC. 5 June 2012. Archived from the original on 10 June 2012. Retrieved 24 June 2012. ^ Diamond jubilee: Flypast bring celebrations to an end Archived 8 June 2012 at the Wayback Machine BBC News. Accessed 24 June 2012. ^ Diamond Jubilee: flypast brings celebrations to an end Archived 8 June 2012 at the Wayback Machine BBC News. Accessed 5 June 2012. ^ Diamond Jubilee: flypast brings celebrations to an end Archived 8 June 2012 at the Wayback Machine BBC News. Accessed 24 June 2012. ^ "Greenwich to become Royal Borough". Greenwich Council. 5 January 2010. Archived from the original on 5 January 2010. Retrieved 5 January 2010. ^ a b "More than 25 towns bid for Diamond Jubilee city status". BBC. 16 June 2011. Archived from the original on 17 June 2011. Retrieved 18 June 2011. ^ "Diamond Jubilee to be marked by creation of new UK city". BBC. 1 December 2010. Archived from the original on 4 December 2010. Retrieved 1 December 2010. ^ "Three towns win city status for Diamond Jubilee". BBC. 14 March 2012. Archived from the original on 25 April 2012. ^ "Games site renamed the Queen Elizabeth Olympic Park". BBC. 7 October 2010. Archived from the original on 14 October 2010. Retrieved 15 October 2010. ^ "Queen Elizabeth II Fields Challenge". The Royal Foundation. Archived from the original on 29 July 2017. Retrieved 24 July 2017. ^ "Woodland Trust searching for jubilee wood site". BBC. 30 July 2011. Archived from the original on 30 July 2011. Retrieved 30 July 2011. ^ Kennedy, Maev (20 March 2012). "Queen's diamond jubilee stained glass window unveiled by MPs". The Guardian. Archived from the original on 29 January 2016. Retrieved 5 June 2012. ^ Hough, Andrew (3 June 2012). "The Queen's Diamond Jubilee: 'Big Ben to be renamed Elizabeth Tower'". Daily Telegraph. Archived from the original on 3 June 2012. Retrieved 3 June 2012. ^ Love, Dickon R. "Church Bells of the City of London - St James Garlickhythe". Love's Guide to the Bells of the City of London. Archived from the original on 11 March 2017. Retrieved 5 January 2017. ^ Towermint "Diamond Jubilee Five Pounds Silver Coin" Archived 5 August 2012 at the Wayback Machine, Diamond Jubilee Five Pounds Silver Coin, 1 May 2012. Retrieved on 7 November 2012. ^ Elizabeth Gibney (12 October 2012). "New Regius professorships to mark Jubilee". Times Higher Education. Retrieved 3 April 2013. ^ "Regius Professorships – entry guidelines" (PDF). Cabinet Office. October 2012. Retrieved 3 April 2013. ^ "Cabinet Office: The Queen awards prestigious Regius professorships to twelve universities" (Press release). PoliticsHome. 29 January 2013. Archived from the original on 22 March 2014. Retrieved 3 April 2013. ^ "Royalty opens Kew Gardens' Elizabeth Gate". Richmond and Twickenham Times. 21 October 2012. Archived from the original on 14 July 2014. Retrieved 12 July 2014. 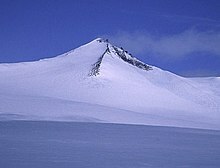 ^ "UK to name part of Antarctica Queen Elizabeth Land". BBC News. BBC. 18 December 2012. Archived from the original on 19 January 2013. Retrieved 18 December 2012. ^ Sarah Lyall, "Archived copy". Archived from the original on 4 March 2013. Retrieved 26 February 2017. CS1 maint: Archived copy as title (link), The New York Times, 1 March 2013. ^ Felicity Morse, "Archived copy". Archived from the original on 9 December 2013. Retrieved 28 March 2013. CS1 maint: Archived copy as title (link), Huffington Post, 5 June 2012. ^ "Queen launches Diamond Jubilee year with multifaith reception". Bahá'í World News Service. 21 February 2012. Archived from the original on 26 May 2012. Retrieved 25 February 2012. ^ "Queen to address Parliament joint session for jubilee". BBC. 19 January 2012. Archived from the original on 23 February 2012. Retrieved 19 February 2012. ^ "Jubilee Time Capsule". Royal Commonwealth Society. Archived from the original on 12 July 2011. Retrieved 15 July 2011. ^ "Diamond Jubilee: Armed forces in parade and flypast". BBC News. BBC. 19 May 2012. Archived from the original on 19 May 2012. Retrieved 19 May 2012. ^ Office of the Governor of Montserrat (8 March 2012). "HRH The Duke of Gloucester Visits Watersports Centre, Inspects Sailability's Fleet". Queen's Printer. Archived from the original on 30 July 2012. Retrieved 8 March 2012. ^ Harris, Carolyn (15 February 2012). "Royals of the Caribbean: The 2012 Diamond Jubilee Commonwealth Tours Begin". royalhistorian.com. Retrieved 22 June 2013. ^ "Hong Kong Jubilee 2012 Events". UK in Hong Kong. Archived from the original on 14 December 2012. Retrieved 6 June 2012. Wikimedia Commons has media related to Diamond Jubilee of Queen Elizabeth II.